WARWICK, U.K. — Sept. 15, 2017 — Square Box Systems, the company behind the industry-leading CatDV media asset management (MAM) system, today introduced a new plug-in architecture for Worker 7. As the next-generation workflow automation solution for CatDV deployments, Worker 7 now includes plug-ins for automating a wide range of common tasks in broadcast, production, and postproduction facilities, as well as enabling third-party integrations for cloud archiving of assets. CatDV Worker 7 is a general-purpose automation engine that enables users to build customized workflows and automate file processing. Worker 7 is highly configurable, with the ability to automate functions such as content ingest, proxy creation, transcoding (including control of external transcoders), content movement and archiving, and file renaming. As such, Worker 7 offers a powerful tool for users to streamline a wide variety of media-workflow logistics tasks. A few examples include copying content securely from camera cards to a SAN or NAS, automatically ingesting assets into CatDV, sending emails to a logger to tag content, performing transcoding to create a web proxy, and archiving to partner LTO solutions. One of the new plug-ins for Worker 7 is a file-and-folder path cleaner that offers the potential to save many hours of work each day in busy mixed-platform production facilities. The plug-in cleans special characters from file and folder names to make them readable by all tools in the media workflow and resolves translation issues between Mac, Windows, and Linux paths. It also streamlines archiving to linear-tape file systems by cleaning file paths and standardizing file names for master, mezzanine, and proxy assets, and then relinking the content in CatDV. Another Worker 7 plug-in enables automatic archiving to third-party storage solutions that have integrated with CatDV, such as Amazon S3, Microsoft Azure, Scality RING, Spectra® BlackPearl®, and HGST. A new analyzer plug-in enables CatDV to extract and store text from a wide variety of documents and image media, including PDFs, images, and Microsoft Office files. Worker 7 also now includes an automatic backup plug-in for the CatDV database. As announced at the 2017 NAB Show, Worker 7 now includes the ability to run as a service for enterprise-scale and cloud deployments, with built-in tools for remote monitoring and transcoding support. 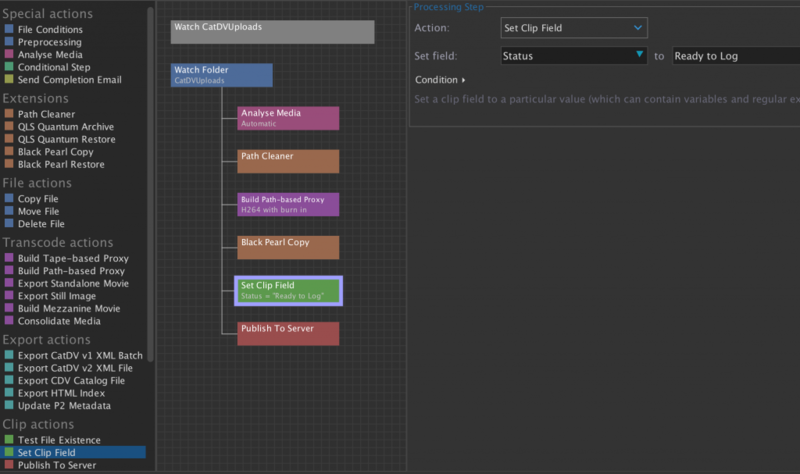 An all-new graphical workflow design and configuration tool makes creating and managing tasks much easier and more intuitive, giving operators an at-a-glance overview of the processing steps in a workflow definition. By clicking and dragging options into the flowchart-style view, operators can manage the workflow more holistically and better understand the impact of each dependency. Square Box Systems will highlight the latest version of Worker 7 on stand 7.J38 at IBC2017. More information about Square Box Systems and CatDV is available at www.squarebox.com.